DENVER, CO – The Blue Knights Drum & Bugle Corps summer national tour has been set. The road to become a Blue Knight started back in the fall of last season where over 1,300 prospective performers from around the United States vied for a chance to be among the world’s elite at the BKXperience Camps (learn more). In the winter and early spring, those prospective members who demonstrated the desired qualities–Attitude, Attendance, Financial Responsibility, Health and Performing Ability–were contracted as members due to their strong commitment and desire to perform as a member of the Blue Knights. As Memorial Day arrives, the Blue Knights will begin their long 12-hour daily rehearsals to develop their show and prepare for the summer national tour. After three weeks of “all-days” training, the 154 Blue Knights performers will depart for a grueling 2½ month tour featuring over 30 performances in 20 states. Blue Knights performers will sleep on buses and gym floors as they trek from city to city, and a crew of volunteers operate large, rolling kitchens out of semi truck trailers to feed the caravans. The Blue Knights will travel with close to 200 people in 4 coach busses, 2 tractor trailer semi-trucks, 2 admin vans and 1 motor home. Want to give the Blue Knights a hand? Read this! Formerly called the “Summer Music Games,” the Drum Corps International Tour is a series of more than 100 drum corps competitions that take place across the country during June, July and August. 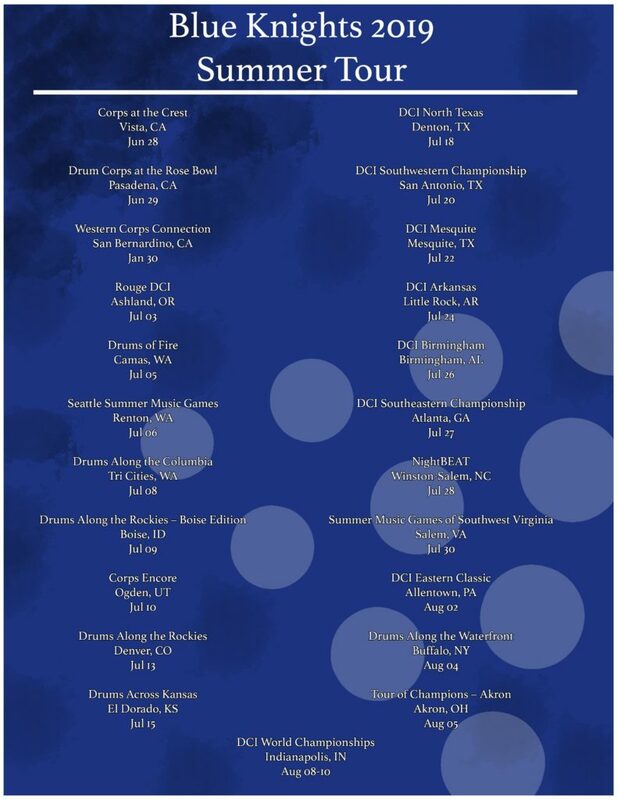 These competitions are of two varieties: events Drum Corps International produces (Premier Events) and events sanctioned through DCI’s national network of Tour Event Partners (Tour Events). DCI creates the tour schedule, and drum corps are assigned to events based on availability and travel and logistical issues. Drum corps travel to the competitions and rehearse and prepare as they make their way between events. The intensive educational and social characteristics of the tour are a key aspect of the DCI experience that differentiates drum corps from scholastic marching band. From the perspective of many students, the tour IS the essence of the drum corps activity. The summer national tour will culminate with the Drum Corps International World Championships, held the second week in August. As dozens of drum corps converge on the World Championships, the World Class ensembles engage in a series of three competitions to establish their final ranking. The top twelve scoring groups in the Semi-Finals qualify for the DCI Finals, which is the most elite stage in marching music. At DCI Finals competition, the Blue Knights put on their best performance of the season in Lucas Oil Stadium in Indianapolis, IN. Read more here. ∴ Get your tickets to Corps Encore here and Drums Along the Rockies here! ∴ Plan on attending a DCI World Championships show and get your tickets here! ∴ More information about mail drops and all-days locations coming soon!